Last week I was flicking through the Big Issue and something really struck me. There’s a section called ‘Missing’ and it has pictures and descriptions of missing people. What seemed really strange to me was that these people weren’t tear away teens, running away from an unstable home. They look like well-respected adults. Take Anne Simpson, aged 60, who’s been missing since 2004. Anne is 5ft 1in tall, slim with shoulder length hair and brown eyes. Church goer Gerald Pope aged 45. Keen Liverpool fan Steve Cook who went missing in Malia back in 2005. 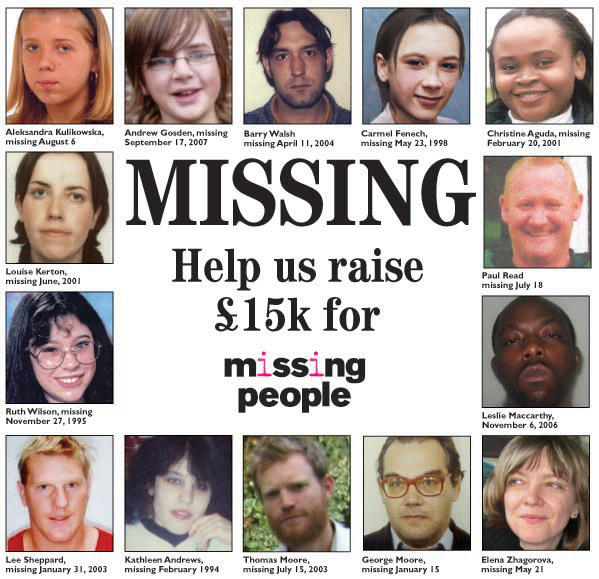 The Missing People charity helps families of missing people, and also acts as a safe place for people who are pronounced as missing to go for help and advice. It offers some form of reassurance for friends and family through the ‘reunited’ section.